I buy staples in bulk. If I find a good bargain, I might buy a year's supply at a time. I've found that this practice can lead to some surprises. I've been using a store brand of dish detergent/soap for years. It was as good as Dawn, but cost much less. It probably was made by the makers of dawn. When my several months supply ran out, I went to buy more. It would not suds. I figured it was just a bad batch, I kept it for pump hand soap. I bought some Dollar Tree brand to mix with it. It did suds more, but not much. Then I bought Walmart's brand. It too had always been almost identical to Dawn, but no more. It would not suds, either. I figured there had been changes in the formulation of all dish detergent. I researched on the Internet, but didn't find much information. I did find that there were a lot of people who were experiencing my same dilemma. Most suspect the removal of phosphates for the lack of suds. Could be, but to show you how far behind the times I am, I thought phosphates were removed from most all household cleaning products 30-40 years ago. It is said the suds don't actually do any cleaning, and that it is the surfactants in the product that are removing grease and dirt. That may well be, but I depended on the suds for another reason. When the suds began to die down, I knew the grease/dirt cutting action was almost spent, as well. Time to add a bit more detergent. With these non sudsing detergents, there are no suds ever, not at first or ever. How are you supposed to know when to add more detergent if you actually need more? It's like so many other things, from one extreme to another. Before, the dish detergent made so many suds, it was hard to rinse them all away. That's one reason I diluted my detergent with water before I refilled my pump bottle. Now, there is not one tiny bubble. It's like washing dishes in plain water. I think a happy medium would have been better. Anyway, I did read several accounts that Palmolive makes suds pretty much the same as it always did. I haven't tested it to see, but I'm sure going to give it a go. How are other members dealing with this? Are you putting up with no suds? Does it bother you? Have you found an alternative that you like, one that gives you at least a moderate amount of suds. I'm just about ready to buy a bottle of children's bubble soap to add to my detergent. Surely it still suds. How else would it make bubbles? I stopped by Dollar Tree and got a small bottle of Palmolive. It says 'Ultra' and it says 'OXY'. It doesn't say what the OXY is or what it does. And on the back it says 'Phosphate free, as always'. I didn't know that. Maybe CP knows how to make suds without phosphates. I was going to get back with you after I tried the Palmolive, but with a few dishes in the sink, I said 'Why not try it now'? I did. Guess what? Same 'ol, same 'ol. No suds. This can't be blamed on the water. My city ranks sixth in the nation for water quality and purity. One guy on the Internet said he solved his problem by buying 100 pounds of phosphate. I guess he adds a little to things such as dish detergent and laundry detergent. I'm pretty green minded and I don't want to pollute the environment. I still think though, there's a way to have a moderately sudsing detergent without hurting the planet. What do some of the rest of you think? I have gotten pretty much any detergent to sud if I put the plug in the sink, then put the soap in (a generous amount), then start the water, super hot and super fast. This suds marvelously. It doesn't necesarily last a long time but at least 5 minutes. I get suds if I'm running the water into the little bowl I put a squeeze of detergent in. Then it's all bubbly. Similar to how you run a bubble bath. I make the suds then I wash. I am very anti suds. I use regular Dawn. I put a tiny squirt on the dish rag and redo every 3-4 dishes. I use "feel of the dish" to tell when I need another squirt. If it squeaks when I run my finger over I, it is clean and I keep going. No squeak, a drop of soap. I have been doing this for ever! It works for me. Glasses and silverware I go by look. I hate soap residue in glasses so if is just me, and water was the only beverage, I just use hot water. I use Dawn. I think it's the best. When I have dishes that are greasy, I wipe the food off with some used clean paper towels that I have saved for this purpose. (recycling) Then that paper towel goes in the trash. I also rinse the food off all the dishes before washing them. To me, that is a help in keeping the dish water clean and sudsy while washing the dishes. I can't wash dishes under running water like some people do. I have tried it and it just does not work for me. I like a sink full of hot sudsy water and a clean dish rag. I just finished washing a dish pan full of dishes so I thought this would be a good picture to go with my comment from yesterday. I used only one sink of hot sudsy water which took just a little bit of Dawn dish detergent and it's lots of subs left. Before washing the dishes, I rinsed the food off with the cold water that I had to run before getting the hot water. I, too, rinse or brush dishes under running water before washing them. I don't want grease on my dish cloth. I remember doing an article about using two dish cloths, one for wiping the stove, etc., because the one I used for dishes was always full of suds. No more. They say 'A picture is worth a thousand words'. So true. I looked at your picture of all the left over suds and said 'How can this be'? I had a lot of dishes this time (I made cornbread and fudge brownies, scrambled eggs, etc.). I put a hefty squeeze of the Palmolive in a dish pan and half filled the pan with hot water. I used the sprayer full force to add the water. Voila! ( or wa-la, as some say), I got suds, lots of suds! And guess what? I still had suds left after doing all the dishes. Wont wonders never cease? Here is how I got confused. 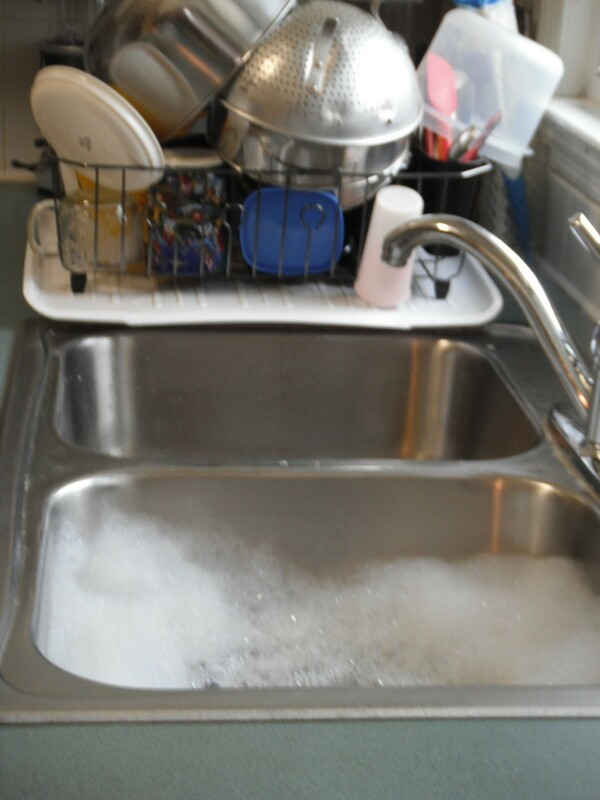 Normally, I have very few dishes to wash. For that reason, I wash them one at a time. From a pump at the sink, I squirt a little detergent on my cloth. If I am not careful, I will have far too many suds on my cloth and it will take lots of rinsing to get them all out. Well, all that has changed. No matter how much detergent I put on the cloth, I don't get any suds. Oddly enough, that same detergent (as I just found out), produces lots of suds when added to a pan of water. I still say the formulation has changed. Maybe now, the detergent is so concentrated, it needs lots of water (space) to open up and do its thing. OK, Ladies, Y'all were right and I was wrong. Now, I'm going to have a piece of that cornbread. And since my cupboards are about bare, I'm going to pretend it's shortbread and top it with apple sauce. Vitals fit for a king! My favorite dish detergents are Dawn. I like the original, the platinum, and my favorite is the platinum foam. It has a dispenser that makes it foam like a lot of hand soaps. They also sell a refill bottle that will fill the foaming dispenser 3 times. Id estimate one pump bottle, and 3-4 refills would last an entire year. I generally wet sponge, apply foaming dawn, wash dish and rinse. When it doesnt foam anymore I add another pump of foam. I dont like filling the sink with water, I think its wastes a lot of water. I prefer a cloth to a sponge, but other than that, this sounds just like what I'm looking for. I'll give it a try.